Curry chicken is a common spicy Indian cuisine across Asia countries. Asian loves spicy food, and Singaporean is always so fascinated by this fabulous curry dish. We have our own version of curry chicken, whereby its gravy is more ‘watery’. Indeed, we like to drench the bread, especially french loaf, into curry sauce, eating the loaf with curry dipping as a meal just by its own. Having more gravy in the curry chicken dish, we can even pour the curry sauce onto a plate of fried bee hoon (rice noodles) or fried rice to complement the dryness of the fried bee hoon/ rice. Well, there isn’t any ‘must‘ to load your curry dish with sauce. I did cook the dry curry (chicken) dishes, too! It’s all up to you! Now, we are talking about how to have the curry chicken cooked easily and conveniently… Cooking curry chicken with pre-packed curry paste is the most convenient way to have an express dinner during weekdays. Simple and quick to fix delicious dinner meal at home, there is nothing bad about using pre-packed curry paste. But of course, some pre-packed curry sauce might be added with flavour enhancer or permitted preservative, similar to canned food. If instant curry paste is not what you are looking for in a home-cooked meal, you may actually go to some wet markets where you can find Indian spice store to have them mixing the chicken curry spices for you. I cooked curry chicken quite frequently. Besides preparing my own curry mixture (sometimes and will tell you how next time), I’ve stored many readily curry spices in various brand, just to try the differences out, yes. 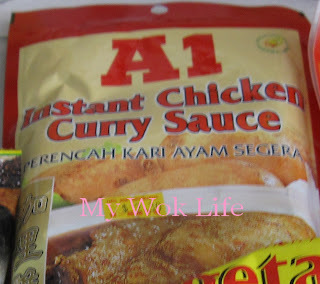 This A1 curry sauce is one of the best tasted curry sauce I found so far. Even just the A1 brand, it has many different types of curry paste. So far, there are two types of curry sauce from A1 tasted the best. I am going to recommend the one with this (*see pic on top/ right) packaging, this time. Not only A1 curry sauce is used in this curry dish, I had another curry powder added, too, just to intensify the robust taste and pungency of my curry chicken dish, and to yield a thicker and more flavoursome gravy (I don’t like it too watery as it tastes bland and too ‘diluted’ to me). Curry chicken is found at almost every eatery/ food store in Singapore! Cooking curry chicken has also become a “regular” practice, for and to be served in some small parties/ events. It’s definately not difficult to find this curry dish in the food menu of buffet catering. I think this will be a good recipe for the same purpose. Yes, I emphasized, it’s quick and easy! Not sure if this brand could be found in Western countries, but for sure it is easily available at many groceries and supermarkets (NTUC Fairprice) here in Singapore. Here with me, there aren’t just sharing about my recommendation and cooking method. I am gonna tell you what have I added to my my curry chicken dish a wholesome meal! First, look at my recipe, even though it was the readily packed (off-the-shelf) curry powder or instant curry paste used, but I’ll never cook a curry dish just liek that as its taste will never be impressive with just the instant packet. Additional ingredients are still needed to be mixed in the recipe for a good curry dish! Also, it’s important to know the right amount of ingredient and water in it, for a perfect taste, isn’t it (winking smile)?! Then, see what I have added here?! It’s the egg (maybe it isn’t a surprise to you..:p)! You almost forget how delicious it was to taste a hard-boiled egg in curry sauce. I added it into my curry chicken meal for more varieties. Anyway, you’ll never go wrong with egg in it! 1) Mix chicken meat with 2 tablespoons of meat curry powder. Combine well and marinate for 20 – 30 minutes. You may leave it refrigerated. 2) In the meanwhile, preboil the eggs, if you have not done so. Peel when cooled, and set aside. 3) Heat wok with 1 tablespoon of cooking oil over medium-high fire, add chopped shallot and garlic, sauté till fragrant. Add in chicken meat and another 2 tablespoons of curry powder, stir fry for 5 minutes or half cooked. Heat off. 4) In a separate large deep pot, heat 1 tablespoon of cooking oil over medium fire. Add potatoes and stir fry for 30 seconds. Transfer half-cooked chicken meat from wok to the pot. Then, add in A1’s instant curry sauce, stir-fry with wooden spatula to combine all ingredients well. Add in water, and continue to stir fry for another 1 minute. 4) When ingredients are well combined. Cover pot with lid, and reduce heat to low fire. Simmer for 30 minutes. Place hard-boiled eggs into the pot, and continue to simmer for another 10 minutes. Gently stir in coconut milk to thicken the gravy, 5 minutes before heat off. Laddle into deep serving bowl, and serve hot with steamed rice or loaf. 1 serving of curry chicken with an egg counts about 360kcal. 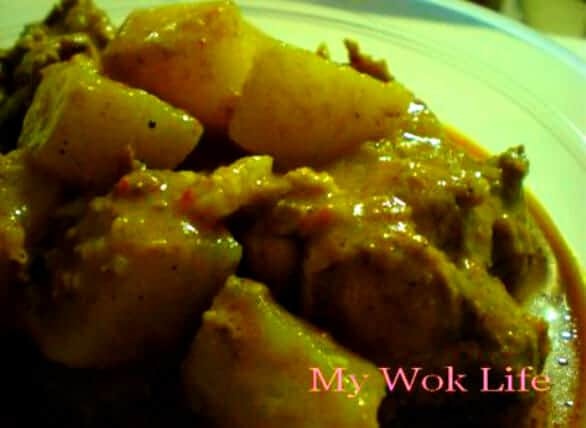 Tips: I never liked chunky potatoes in my curry dish. Bite-sized cubes will be just nice as it is easier to cook and serve. * No worries if the water put in is not enought to cover the ingredient fully, but make sure potatoes are covered. I am surprised that you couldn’t find this curry paste in other wet market or Fairprice which both are the most common places selling it. Perhaps you should get assistance from the Fair Price staff to help you find it in their supermarket. Also, try Carrerfour and Giant, I am certain that you will be able to find it there. Hi I tried your recipe and it’s fantastic! You said 4 tbs of meat curry powder is required. In your recipe, 2 tbs was used to marinate the chicken, what about the 2? Oops, I forgot to write it out. It was supposed to be added in step 3, add when frying the chicken meat. So, I have just added in the correct step. Thanks for highlighting this! Btw, if the recipe without the addition of 2 more tablespoon of curry powder is good and spicy enough, feel free to omit it. Adding the original 2 more tablespoons of curry powder might be too spicy for some. You can add in a few stalks of broken lemon grass to add a nice fragrance to the curry! Hi! I tried your recipe few months ago. The curry chicken turned out to be superb! One of the best I would say. I didn’t follow your exact recipe. I added more shallots, garlic and Baba curry powder because I add more water. Thanks for sharing! Totally agree with u ! I love this A1 curry paste, simply the Best so far ! I encountered exactly the same experience just to experiment out varies type of instant curry paste in the market till I finally settle down with A1 ! Thanks so much for sharing the tips on additional mixture to enhance it much sedap ! Ya man! Tries some other new ones recently, but not as great. Hi Patricia! Can I ask you if I have leftover curry how do I store it for next day consumption? Thank you! However, to play safe and reduce wastage in future, you may scope out possible portion which you may like to store before consumption. This unconsumed portion may be stored in freezer as long as a week. Hi :) It looks awesome! I am a beginner cook learning how to cook at home slowly. heheh. Would like to check if I can exclude the coconut milk for the curry. Would it still taste fine? Well, you may replace coconut milk with low fat milk, but to totally go without any milk might taste too “curry-ish”. And, it might not taste too much of the usual Singapore curry chicken we are familiar with though. Hence, unless it’s for dry curry dish, I would still put little or replace with cow’s milk, if possible. If I wanna cook more chicken, 3kg. I should add 3 packets of A1 Curry Paste right? Coconut milk amount should add also? May I know what is the purpose of shimmering for 30 minutes? To bring out the flavour or to ensure that the potato is soft enough? Thanks! May I know if its ok if I use another brand of chicken curry powder instead of baba meat curry powder? Will the taste be altered? Thanks! Go ahead to do it. Cooking is about feeling. :) As for technical wise, it changes a little, if you have sensitive palate.